Drop-our rates for schoolgirls in Cameroon are closely linked to the problems of housing in towns where schools are located and extreme poverty that forces some children start working, instead of studying, to earn money to support their parents and siblings. With the ‘Shelter to educate’-project, Brandt school student, Theresia, who is originally from Cameroon, wanted to prevent this. After being rewarded the Commitment Award price in 2015, Theresia was able to rent an apartment in Buea and cover study & food expenses for three girls. 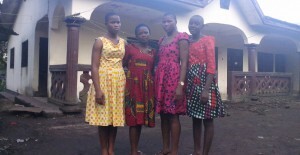 Theresia (second from left) with ‘her’ three girls in Cameroon. Hereby the project used a ‘family adoption approach’, whereby the girls are made to see the shelter as their own homes. This was achieved with a personal approach; pictures of the participants and their families, gifts for Christmas & New Year and Skype-calls from Theresia on a bi-weekly basis.